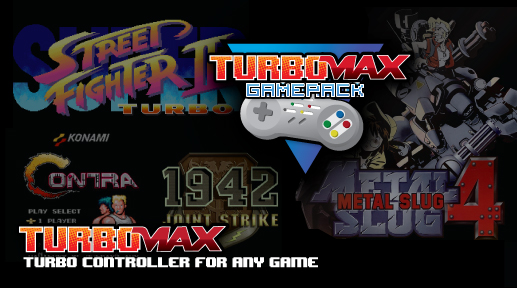 Add Turbo feature to your regular controller with the Turbo Max Gamepack for Titan One. You can set buttons on Turbo mode to FAST, MEDIUM or SLOW speeds. Ideal for shoot-em-ups and other button mashing games. Player LED 1: Controller in regular mode, all TURBO MOD are disabled. Player LED 4: TURBO MOD is enabled, check configuration section below to activate/deactivate turbo mode on individual buttons. PS3: Hold SELECT+START for 2 seconds to enter in configuration mode. XBOX 360: Hold BACK+START for 2 seconds to enter in configuration mode. Important: Always keep the SELECT (or BACK) button pressed while in configuration mode. To exit the configuration mode, release the SELECT (or BACK) button.